In the Caucasus mountains of Russia, not far from the cities Tzelentzchik, Touapse, Novorossiysk and Sochi, there are hundreds of megalithic monuments known as dolmens. Russian and foreign archaeologists have not yet discovered their use. All these megalithic dolmens you see below in the pictures are dated from 10,000 to 25,000 years ago, according to the website Kykeon. Other archaeologists put the age of these megalithic structures at 4000 to 6,000 years old. Thousands of prehistoric megalithic monuments are known throughout the world. Some of the least known outside the former Soviet Union, however, are those in the Caucasus. These dolmens cover the Western Caucasus on both sides of the mountain ridge, in an area of approximately 12.000 square kilometers of Russia and Abkhazia. The Caucasian dolmens represent a unique type of prehistoric architecture, built with precisely dressed cyclopic stone blocks. The stones were, for example, shaped into 90-degree angles, to be used as corners or were curved to make a perfect circle. The monuments date between the end of the 4th millennium and the beginning of the 2nd millennium B.C. While generally unknown in the rest of Europe, these Russian megaliths are equal to the great megaliths of Europe in terms of age and quality of architecture, but are still of an unknown origin. In spite of the variety of Caucasian monuments, they show strong similarities with megaliths from different parts of Europe and Asia, like the Iberian Peninsula, France, Great Britain, Ireland, Netherlands, Germany, Denmark, Sweden, Israel and India. A range of hypotheses has been put forward to explain these similarities and the building of megaliths on the whole, but still it remains unclear. Approximately 3,000 of these megalithic monuments are known in the Western Caucasus, but more are constantly being found, while more and more are also being destroyed. Today, many are in great disrepair and will be completely lost if they are not protected from vandals and general neglect. 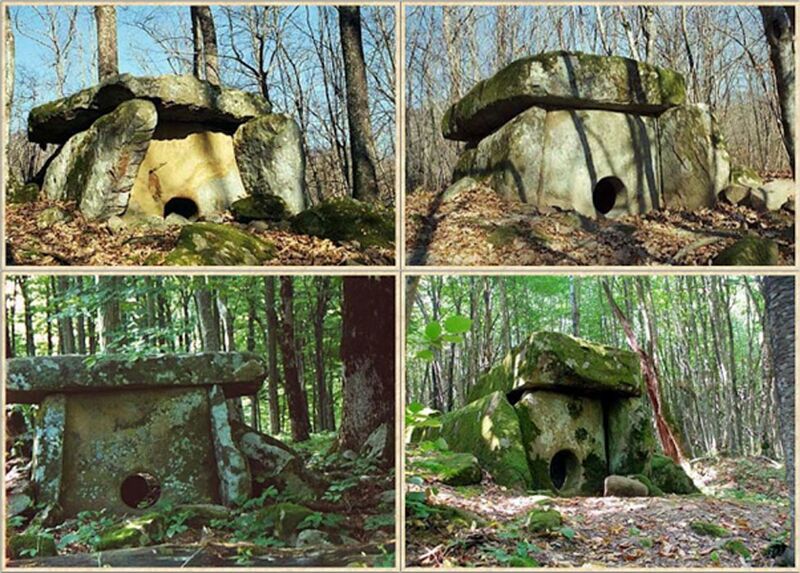 The dolmens are found in the area of Krasnodar. Krasnodar is a city and the administrative center of Krasnodar Krai, Russia, located on the Kuban River about 148 kilometers (92 mi) northeast of the Black Sea port of Novorossiysk. Concentrations of megaliths, dolmens and stone labyrinths have been found (but little studied) throughout the Caucasus Mountains, including the Abkhazia. Most of them are represented by rectangular structures made of stone slabs or cut in rocks with holes in their facade. These dolmens cover the Western Caucasus on both sides of the mountain ridge, in an area of approximately 12.000 square kilometres of Russia and Abkhazia. The map above shows locations of known Dolmen structures. The original source for the following images came via a Russian Website. The dolmens have a limited variety in their architecture. The floor plans are square, trapezoidal, rectangular and round. All of the dolmens are punctuated with a portal in the center of the facade. While round portholes are the most common, square ones are also found. In front of the facade is a court that usually splays out, creating an area where rituals possibly took place. The court is usually outlined by large stone walls, sometimes over a meter high, which enclose the court. It is in this area that Bronze and Iron Age pottery has been found – which helped date these tombs -, along with human remains, bronze tools and silver, gold and semi-precious stone ornaments. The repertoire of decoration for these tombs is not great. Vertical and horizontal zigzags, hanging triangles and concentric circles are the most common motifs. One decorative motif that is quite common is found across the top of the porthole slab. It can best be described as a lintel held up by two columns. Pairs of breasts, done in relief, have also been found on a few tombs. These breasts usually appear above the two columns of the porthole decoration. Perhaps related to these are the stone plugs, which were used to block the porthole, and are found with almost every tomb. They are sometimes phallic-shaped. One of the most interesting megalithic complexes – group of three dolmens – stands in a row on a hill above Zhane River on the Black Sea coast in the Krasnodar area near Gelendzhik, Russia. In this area there is a great concentration of all types of megalithic sites including settlements and dolmen cemeteries. Large stone mounds surrounded the two monuments. The article ‘ 25,000-Year-Old Buildings Found in Russia’ was originally published on Humans Are Free and has been republished with permission. This comment is very well thought out. I, too, believe that dolmens must have been "survival structures", because there is no way people would have gone to all the effort to put a several ton roof on something just to protect themselves from something such as the weather. A structure like this would not protect someone very well from other humans, because humans could just do something like build a huge fire around the structure and kill everyone inside with the heat and the smoke; humans are much too clever to be thwarted by this kind of defense. The near complete lack of artistic carvings in the inner and outer walls of the dolmens also points toward their just being made for survival. I personally think it is naive to assume that the structures were actual dolmens (burial structures) just because a lot of them have human remains inside. To me, the human remains just signify that people died inside the structures. Also, the device which blocks the entry to the "dolmen" is always on the inside, which would not be the case if people were buried in those structures by other people. There must have been a lot of large predators in that area at the time. I do not believe that humans coexisted with dinosaurs millions of years ago. There simply aren't any fossils of ancient humans, even though fossils of dinosaurs abound all over the world. It is interesting to note that interposed human/dinosaur tracks have been found in several locations. Hard to explain these tracks if they didn't "co-exist." Which, in turn, suggests that man is either much OLDER than conventionally assumed, or the dinosaurs died off much LATER than conventionally assumed. Take your pick....pretty much has to be one or the other. With interposed tracks, there is no "middle ground" here!! Things like this will drive ya to drink!! First, the random dating of 25,000 years is just not supported by known RC site test. General RC results put most dolmens on both the Korean Peninsula and Caucuses Region at about 7K YBP (which collectively contain about 60% of all known dolmens). Second, if Buckminster Fuller's axiom that "form follows function" is relevant to folks that lived in a primitive society, then design specifics tell us a lot about use characteristics. The one significant standard to all dolmens, is that they are all 'capped' or covered with large over sized slab stones or boulders. The stone 'roofs' are heavier than any other part of the building. Now lets apply primitive survival thinking to moving very heavy stone slabs to cover a small (less than room sized) area. Sometimes, particularly in the Caucuses, the heavy stone covering sets over a tightly enclosed "room" with a very small (about 20") round entry-exit hole. That is just large enough to allow an average human of that time (about 5'6" for males) to enter and exit relatively easily. To me, what that suggests is the dolmens are a 'survival imperative' structure. A 'safe room', as it were at the time. They certainly were not to protect against human attackers, as the stone slab "roofs" serve no specific purpose in that regard. So the predators were very large and muscular and could move or root out stones and coverings that were not at least several tons. (dinosaurs, very large flyers, anyone?) They were not designed to protect against ground predators like giant cats and bears, as those animals also cannot move large stone boulders. I wasn't there, so I can't make definitive statements, but I have lived in a primitive social structure,, and I know from personal experience how survival imperative works.Nothing including labor is lost or wasted. Every breath, step, process or procedure is related to immediate survival, in not only the harshest or marginal survival zones, but in moderate climate zones as well. So, in my considered opinion, dolmens are 'survival imperative" structures, built to defend against several different large predators. I make the case in my book, "Earth Epochs" that a major global cataclysm occurred at almost exactly 7K years before present, taking out a very large worldwide population, and reducing remnant populations to harsh primitive survival technologies. Absolutely all ancient written history, as well as folk tales and legends tell us that in the ancient past a major catastrophe occurred that destroyed the planet, sank whole continents, and raised others. Those same references tell us that man lived along side a number of different dinosaurs up until our fairly recent past. (within the last 1,500 years). Now before a bunch of you "incremental gradualism" devotees get to howling too loud, just go look at the evidence and give me an explanation that covers all the dolmens, and representations of dinosaurs on rock wall art and pottery, and give me a better explanation that explains those collective anomalies (as a group). these buildings could demonstrate the utilitarian aspect of ancient astronomy.